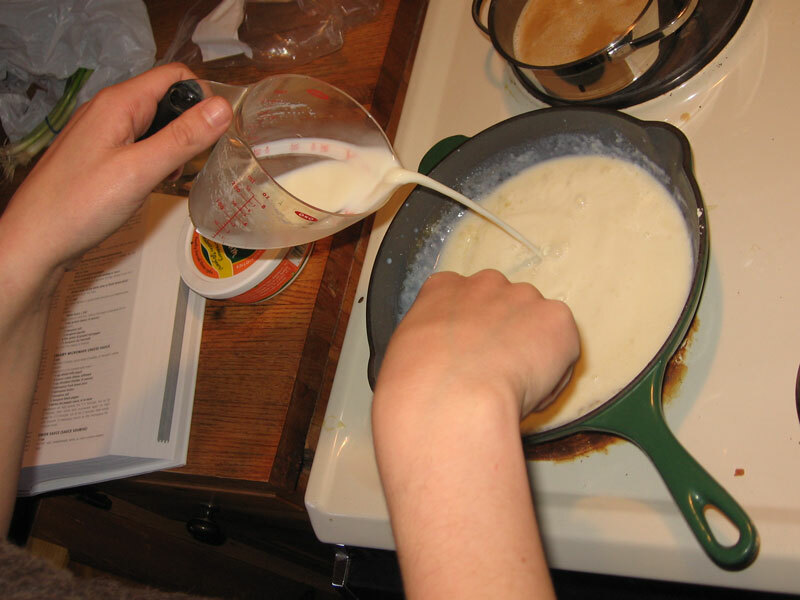 I even had some yummy local cheese, and enough butter and flour to make a white sauce. Crepe time! I made the batter first thing, as it needs to sit in the fridge for a while. I am not exactly sure why this is, but I do what they tell me. Meanwhile, I made a bit of coffee, and started on the filling. 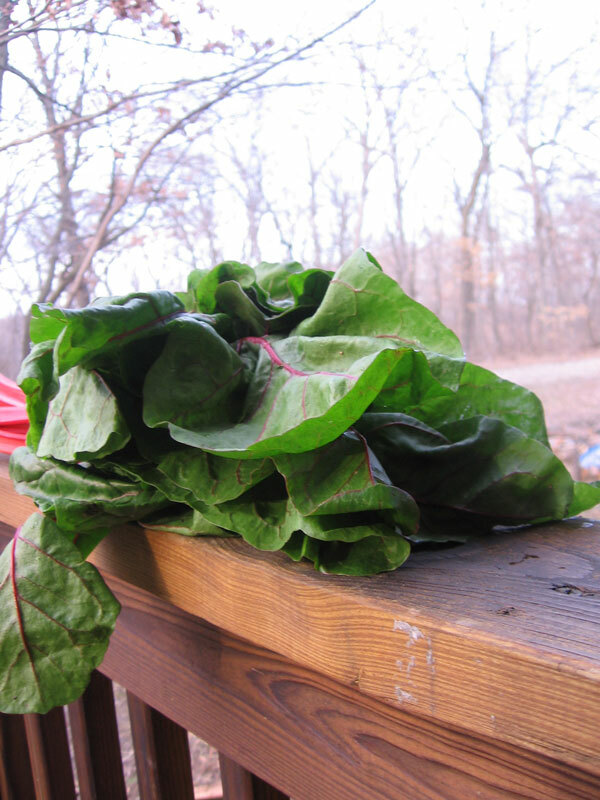 To cook the chard, use a little olive oil, (mine was flavored with Tunisian olives and harissa). To the oil, add chopped onion, chopped celery, and saute until the veggies are translucent. Then add roughly chopped chard and cook it until tender. Salt and pepper to taste. Covered the chard, and placed in the oven on warm. For the sauce, I followed the recipe for “white sauce” in the updated Joy of Cooking. The recipe calls for flour, butter, and milk. 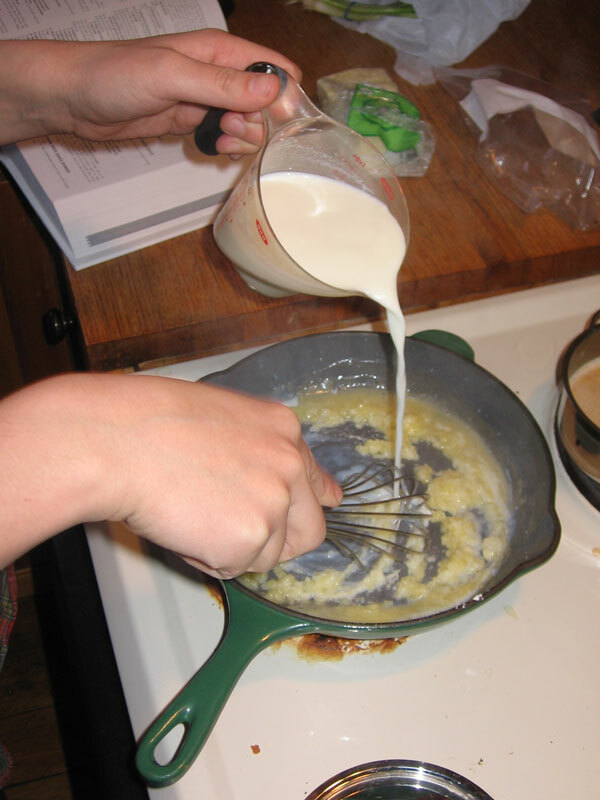 Mix the flour and butter, and when the butter is melted, slowly add the milk, and whisk away! 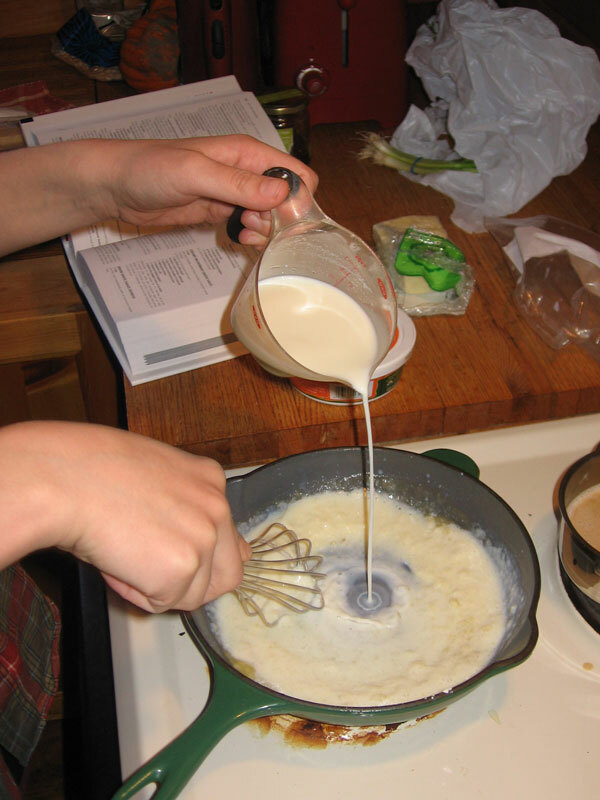 It certainly takes some whisking to make a white sauce smooth. I always have a bit of concern that it will turn out lumpy, but it is usually okay in the end. That’s it. Oh, and salt and pepper. To make it cheese sauce, I added a bunch of prairie breeze cheese, chopped up into little bits. And some smoked Spanish paprika for flavor. Back to the crepe batter. 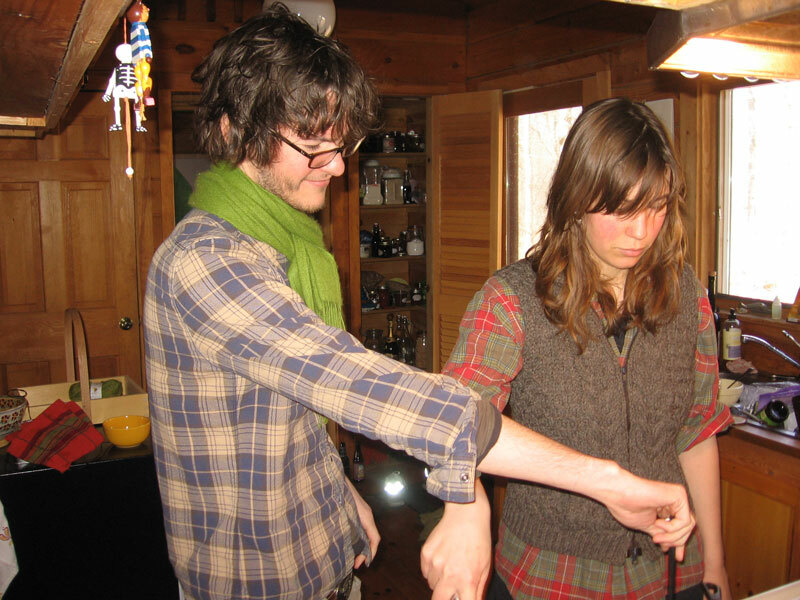 I warmed the pan, and Skye was over and he pretty much took over the job of crepe making. I actually don’t think that I flipped a single crepe. 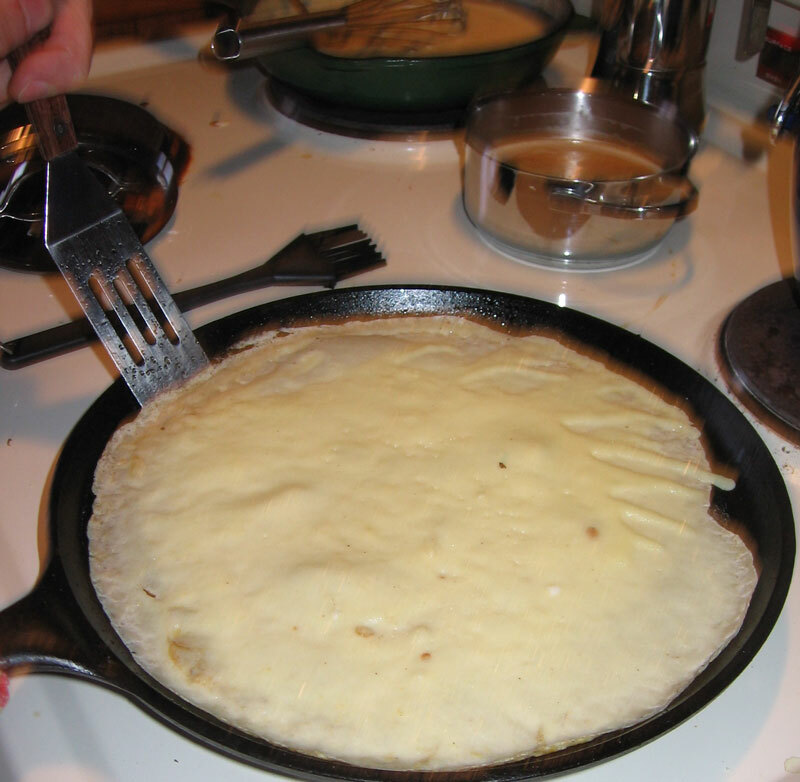 As Skye finished the crepes, he transferred them to a plate in the warm oven, and right before all the crepes were finished, we warmed the cheese sauce, set the table, and were ready to eat. Delish, delish! i wanna make these this week!! 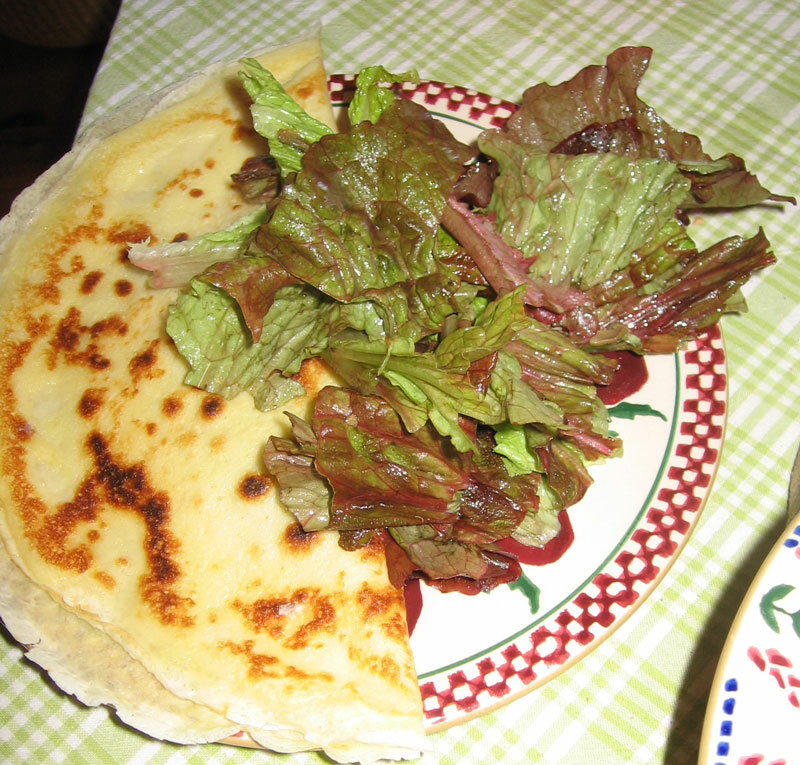 Moms used to make crepes on birthdays but with w/asparagus and swiss cheese in the middle and a white sauce on top that had sauteed cucumber and fresh avocado pureed into it – sounds weird but yumm! I wish I could make them with you. And I would love your mom’s recipe, if you have it, or can ask. I miss you (a lot)!